The Thirty Tyrants (οἱ τριάκοντα τύραννοι) is a term first used by Polycrates in a speech praising Thrasybulus (Arist. Rhet. 1401a) to describe the brief 8-month oligarchy which governed Athens after the Peloponnesian War – roughly late-summer 404 BCE to early-summer 403 BCE – also called simply “the Thirty.” The Thirty’s rule became marked with such brutal and repressive actions that “oligarchy” emerged from it so discredited Athenians refused to consider “rule by the few” a respectable alternative to democracy for three generations. Our information on the Thirty comes primarily from Xenophon, the Aristotelian Athenaion Politeia, Diodorus Siculus, and Justin with additional information from Plutarch, Pausanias, and Nepos. We also possess numerous mentions of the regime in the speeches of Andocides, Lysias, Demosthenes, and Isocrates. Unfortunately, not all of these sources agree with each other and scholars must make reasoned inferences regarding several key events. Although Xenophon, who lived through the time of the regime, never uses the term Thirty Tyrants, he describes their rule as τύραννειν or tyrannein, lit. “to be sole ruler” (Xen. Hell. 2.4.1; cf. 23.16; 6.3.8). Other authors use the term δυναστεία or dynasteia, lit. “power” or “lordship” (e.g. Andoc. 2.27; Plat. Epist. 7.325a; [Arist.] Ath. Pol. 36.1). The title The Thirty Tyrants had nonetheless become the standard designation at the time of Diodorus and Justin. About November 405 BCE, the Athenians, led by Theramenes, entered into extended negotiations with the Spartans to capitulate, prompted by the Spartan naval victory at Aegospotami, which had effectively ended the Peloponnesian War. Although the Corinthians, Thebans, and other poleis urged for the destruction of Athens, the Spartans successfully argued that the Greeks could not “pluck-out one of Greece’s two eyes” (Justin 5.8.4). The Spartans instead demanded the Athenians destroy their Long Walls and fortifications about Piraeus. The Athenians would also recall all exiles and withdraw both their magistrates and cleruchies (settlements) from all other poleis territories. Moreover, the Athenians would now have “the same friends and enemies” as the Lacedaemonians (Xen. Hell. 2.2.20; Diod. 13.107.4; 14.3.2; Plut. Vit. Lys. 14.4; Andoc. 3.11-12, 39; Lys. 13.14). At the same time, the Spartans demanded the Athenians recraft their laws to favor oligarchy ([Arist.] Ath. Pol. 34.3). The Athenians accepted these conditions by early April 404 BCE. The Athenians appointed 5 Ephors (overseers) to organize all voting through Phylarchoi (Tribal Rulers). The Athenian Ekklesia (Assembly) soon divided into three camps: those who favored a patrios politeia (ancestral constitution), those who desired to keep a democracy, and those who wanted an oligarchy. Debate and inaction continued through September 404 BCE, opposition to any resolution led primarily by the democratic faction, until the growing delay forced the Spartans to intervene. The Spartans instructed the Athenians to choose 30 men to manage all the affairs of the polis. Theramenes, the de facto leader of the democrats, nominated 10 of these men, the 5 Ephors nominated 10, while the Ekklesia would elect those 20 and choose the final 10. These 30 men would then “draw-up the patrios nomoi (ancestral laws) according to which [the Thirty] would govern” (Xen. Hell. 2.3.2; Diod. 14.4.1). The 30 Athenians elected were: Aeschines (not the orator), Dracontide, Mnesitheides, Anaetius, Erasistratus of Acharnae, Onomacles, Aresias, Eratosthenes, Peison, Aristoteles, Eucleides, Phaedrias, Chaereleos, Eumathes, Pheido, Charicles son of Apollodorus, Hiero, Polychares, Chremo, Hippolochus, Sophocles (not the playwright), Cleomedes son of Lycomedes, Hippomachus, Theogenes, Critias son of Callaeschrus, Melobius, Theognis, Diocles, Mnesilochus, Theramenes son of Hagnon. Interim Government: The Thirty re-established the Boule (Council of 500) and (re-)appointed other magistrates such as the 9 Archons (Leaders), The Eleven (Prison Magistrates), the Strategoi (Military Commanders), as well as the Board of Ten Treasurers of Athena and the Other Gods among other miscellaneous appurtenances of the democracy. The Thirty, however, also created “The Ten,” 10 men supervised by The Thirty who would rule Piraeus. The Thirty also hired 300 Mastigophoroi (whip-bearing attendants) to act as a kind of police force. Eliminate Opponents: The Thirty presided over a trial in the Boule against the previous strategoi, taxiarchs (brigadiers), and miscellaneous others, who had opposed peace with Sparta. Though the Thirty condemned many of these men to death, they did not confiscate their property. Soon after this trial, the Thirty declared they must purge “the polis of unjust men and the rest of the citizens inclined against virtue and injustice” (Lys. 12.5). They executed sycophants, thieves, bribers, and other “undesirables” after more trials before the Boule. The Athenians generally accepted these initial actions as necessary (Xen. Hell. 2.3.12; [Arist.] Ath. Pol. 35.3; Diod. 14.4.2; Lys. 25.19). Reform the Laws: The Thirty rescinded various grants of citizenship to foreigners and revoked several proxenies (ambassadorships, lit. "compacts of friendship"). They also erased the laws of Ephialtes and Archestratus, and thus by consequence expanded the power of the Areopagus (High Court of Appeal). The Thirty then began to edit the Laws of Solon inscribed and posted next to the Royal Stoa. They also reoriented the Pnyx (the Ekklesia Meeting Place) so as to limit the maximum size of those gatherings. Finally, they had the Eleven report directly to them instead of the courts. During these events, however, fractures began to develop within the ranks of The Thirty. Most of the group, it seems, desired more radical changes. hey apparently wanted to remake Athens into a model of Sparta. They sought to imitate the Spartan γερουσία or gerousia (“Council of Elders”), the Ὅμοιοι or homoioi (“The Equals,” lit. “those who are alike”), and the περίοικοι or perioikoi (“free non-citizens,” lit. “dwellers about”) of Lacedaemonian society. The Thirty would serve as the Athenian gerousia. They would then designate “the included,” the “best” or “most suitable” men to become the Athenian equivalent of the homoioi. The Thirty then “excluded” the rest of the population, making them perioikoi (remain free but not considered Athenian citizens). It appears that additional disagreements occurred within the Thirty over precisely how this new government would function, i.e. how much power resided with the Thirty versus the role of the included. The Thirty, moreover, never disbanded the Boule. When the Thirty wished to have the approval of a larger group, they typically appeared before the Boule. Still, a small group within the Thirty, led again by Theramenes, sought to expand the franchise of the “included” to 5,000, but the stricter oligarchic faction led by Critias and Charicles prevailed and chose to include only those 3,000 whom the Thirty felt most supported the new government. By February 403 BCE, only the 3,000 could live inside the asty (city-proper) of Athens. The excluded had to relocate elsewhere about Attica, and the Thirty proceeded to confiscate their property. As a result of these actions, many Athenians began to flee to neighboring poleis like Boeotia, Cornith, Argos, Chalcis, Megara, and Oropus and thus became fugitives. About this time, the Athenian exile Thrasybulus led a group of approximately 70 men and seized the defensible hill Phyle north of Athens. Although a relatively small force, the Thirty responded to this threat by leading the 3,000 out of Athens to blockade the encampment. Bad weather, however, forced them to withdraw. Thrasybulus’ armed threat fractured the fragile unity of the Thirty between those who still desired narrow oligarchy against those who still desired to increase the Athenian franchise. Critias and Charicles prevailed again, and, after the Boule gave the Thirty power to decide life or death over the excluded, Critias removed Theramenes’ name from the list of the included and had him executed. The Thirty continued to revise the list of the “included” as they saw fit. A growing number of Athenians became alarmed as the Thirty now seemed to execute men not for crimes but for motives of faction (Lys. 30.13). The Thirty then disarmed the excluded and deposited their weapons on the Acropolis. Shortly thereafter, the Thirty’s growing fear as well as greed and a ruthless determination to eliminate all opposition drove them to execute prominent men in much greater numbers. The sources agree that about 1,500 Athenians died under the Thirty. The Spartans had also issued decrees to other Greek poleis. They were to surrender any Athenian fugitives to the Thirty. Most of the Greeks complied, but Argos and Thebes refused. By May 403 BCE, about 700 men had gathered with Thrasybulus at Phyle: some 100 Athenians, 300 foreigners, and 300 mercenaries hired by the metic (foreign resident) Lysias. The Thirty proceeded to seize Eleusis and Salamis. The Thirty executed an additional 300 men by vote of the 3,000. The Thirty attempted to reconcile with Thrasybulus and offered him Theramenes’ place. Thrasybulus refused. He instead demanded the Thirty establish the patrios politeia. At the behest of the Thirty, the Spartans sent an armed garrison to Athens to assist the Thirty in countering Thrasybulus’ now growing threat. When the Thirty again dispatched a small force to seize Phyle, led by the Lacedaemonians, Thrasybulus counter attacked. He routed the force and immediately proceeded to Piraeus. Thrasybulus reached Mounichia Hill with some 1,200 men. The Thirty attacked with an armed force from the 3,000 again. They lost about 70 men and both Critias and Hippomachus fell during the fierce battle. 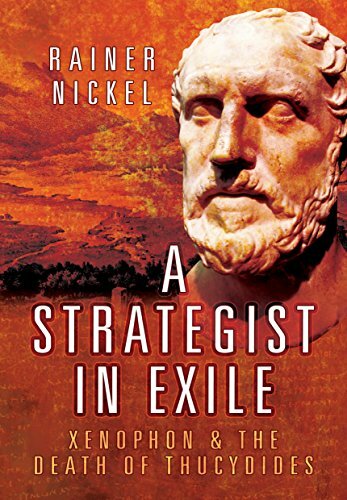 More importantly, the oligarchs failed to overcome the men occupying Piraeus. Some Athenians in the polis now wanted to depose the Thirty, while others still refused to yield to the men in Piraeus. Those of the Thirty and the Ten still alive, as well as the Eleven, all fled to Eleusis. They left another 10 men in charge of Athens itself. This new Board of Ten attempted to attack Piraeus one more time but failed and soon found Athens besieged by Thrasybulus’ forces. Because of internal divisions within Sparta, the Spartans responded tepidly to these events. Although they initiated a naval blockade on Piraeus, they also suffered defeat in another hoplite battle against the men still occupying Piraeus. The Spartans had now begun to grow weary of Athenian infighting. The ongoing conflict, moreover, began to fracture the Spartan League (the Corinthians and Boeotians, for example, refused to assist Sparta against the Athenians in Peiraieus). Consequently, when Sparta declined to offer any further overt support to the Thirty or the Board of Ten in Athens, the oligarchy collapsed. The Spartans assisted in mediating a settlement between the men occupying Piraeus and those of the 3,000 still in Athens and then withdrew from Attica. The two sides agreed that peace would ensue and that each Athenian return to his own possessions except for the property of the Thirty, the Eleven, and the original Ten. Those groups and their more prominent supporters could all remain in Eleusis (Xen. Hell. 2.4). If any of them wished to return to Athens, then they could offer euthynai (submit to an investigation of their conduct while serving in office). Finally, the Athenians swore oaths of amnesty not to remember past wrongs. One last conflict, however, occurred between the remaining Athenian oligarchs residing in Eleusis and the restored democracy of Athens. Some of the returning exiles now wished to ignore the amnesty and avenge themselves against the survivors residing in Eleusis. When word also reached Athens that the remaining oligarchs had in fact begun to hire mercenaries, the Athenians marched en masse to besiege Eleusis. Under the ruse of a conference to negotiate a settlement, the Athenians killed all of the oligarch’s military commanders. The final fate of the surviving Thirty, the Eleven, and the Ten remains unknown. Justin says the tyranny died, while the orator Isocrates attests “those most responsible for the evils” were killed during that final conflict, but they both remain unclear as to the precise number or identity of the victims. The restored democracy nonetheless confiscated the property of the Thirty, the Eleven, and the Ten as well as the property of the oligarchy’s more prominent supporters. As a result of the Thirty’s actions during their rule, the Athenians abandoned even entertaining the idea of “oligarchic rule” for the next forty years. Accame, S., "Theramenes: The End of a Controversial Career," Museum Africum 5 (1976). Bruce, I.A.F. An Historical Commentary on the Hellenica Oxyrhynchia. (Cambridge University Press, 1967). Busolt, G., "Aristoteles oder Xenophon," Hermes 33 (1898). Dorjahn, A., "On Pausanias' Battle with Thrasybulus," Classical Quarterly 20 (1925). Dorjahn, A. Political forgiveness in Old Athens: The Amnesty of 403 B.C. (AMS Press, 1970). Dorjahn, A., "The Athenian Senate and the Oligarchy of 404-3 B.C.," Philological Quarterly 11 (1932). Fuks, A., "Notes of the Rule of the Ten at Athens 403 B.C.," Mnemosyne 6 (1953). Hannestad, K. De 30 tyranner: studier i Athensk forfatningshistorie i slutningen af 5. århundrede.. (Rosenkilde og Bagger, 2015). Hignett, C. History of the Athenian Constitution to the End of the Fifth Century B.C. (Oxford University Press, 1952). Krentz, P. Thirty at Athens. (Cornell Univ Pr, 1982). Loeper, R., "The Thirty Tyrants," Zhurnal Ministerstva Narodnago Prosvescheniya (1896). McCoy, W.J., "Aristotle's Athenaion Politeia and the Establishment of the Thirty Tyrants," Yale Classical Studies 23 (1975). Moore, J.M. Aristotle and Xenophon on Democracy and Oligarchy. (University of California Press, 2015). Rhodes, P.J. A Commentary on the Aristotelian Athenaion Politeia. (Clarendon Press, 1993). Salmon, P., "L'Etablissement des Trente a Athenes," L'Antiquite classique 38 (1969). Walback, M., "The Confiscation and Sale of the Property of the Thirty Tyrants in 402/1 B.C.," American Journal of Philology 84 (1980). Planeaux, Christopher. "The Thirty Tyrants." Ancient History Encyclopedia. Last modified November 13, 2015. https://www.ancient.eu/The_Thirty_Tyrants/. Planeaux, Christopher. "The Thirty Tyrants." Ancient History Encyclopedia. Ancient History Encyclopedia, 13 Nov 2015. Web. 24 Apr 2019. Written by Christopher Planeaux, published on 13 November 2015 under the following license: Creative Commons: Attribution-NonCommercial-ShareAlike. This license lets others remix, tweak, and build upon this content non-commercially, as long as they credit the author and license their new creations under the identical terms. Please note that content linked from this page may have different licensing terms.